Mother of Christ and Our Mother: Mary! 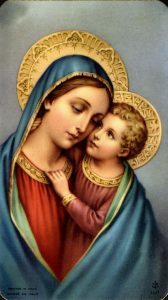 Mary is the Mother of Christ for, as all other mothers do for their children, she formed and nourished with her most pure substance the Body of Jesus. Christ was, Saint Paul says, “made of a woman”. If, by His eternal birth in splendid holiness, Christ is truly the Son of God, Deum Verum de Deo vero, by His temporal birth, He is truly the Son of Mary: the only Son of God is also the only Son of the Virgin. Such is the ineffable union existing between Jesus and Mary: she is His Mother, He is her Son. This union is indissoluble; and as Jesus is at the same time the Son of God come to save the world, Mary is indeed intimately associated in the vital mystery of all Christianity. He wills to give us Mary to be our mother. This is one of the forms of the truth that the Word is united in the incarnation to all humanity, and that the elect form the Mystical Body of Christ from Whom they cannot be separated. Christ will give us His Mother to be also ours in the spiritual order; Mary will not separate us from Jesus, her Son and our Head.